-Use natural logs. However, if you use the artificial logs, be sure to follow the directions on the package. -Check your fireplace and chimney often and keep them clean and in good repair. -Always make sure that a good fire screen is in front of the fireplace. -Keep the damper (have your parents show you where it is and how it works) set so the draft (flow of air) will remove all smoke and gases when the fireplace is on. Remember, too much air flow might let the fire get out of control. -Keep the area near the fireplace clear of materials like papers, books, toys, etc. Everyone should know about the possibility of flying sparks from the fire and what to do about them. -Make sure that the fire is completely out before going to bed or if you plan to leave the house. -Do not stack artificial logs in the fireplace like you would real wood. 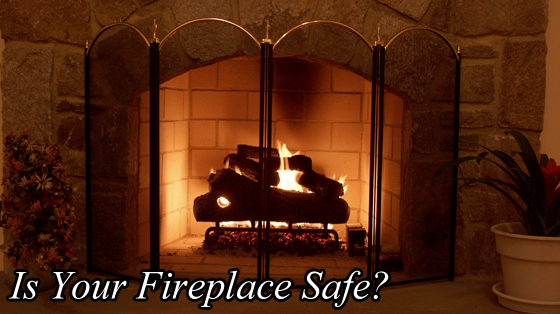 -Do not use your fireplace if it has loose bricks or needs to be cleaned. -Do not burn charcoal, coal, or plastic materials (wrap, cups, plates, etc.). -Do not burn garbage in the fireplace. -Do not ever use gasoline or other such liquid to start or help a fire to start. -Do not allow small children near the fireplace. -Do not leave a fire unattended. Always keep a fire extinguisher close at hand. Make sure that everyone knows how to use it. Keep emergency phone numbers on or next to the telephone. Always make sure your smoke and heat detectors are functioning properly and that you have checked to make sure it has a working battery.